Quality tile and grout cleaning in Moorestown, NJ and stone floor cleaning are done with chemicals that can only be used with a truck mounted hot water extraction cleaning system. Majestic Carpet Cleaning has a system like this that restores tiles and stone to its new appearance. The indoor air quality is elevated by this cleaning system. The moldy grout will no longer have that wet smell or green discoloration. Pet odors that seemed to linger in the house will suddenly be dissolved and disappear. The whole house will have that fragrant odor of lightly perfumed soap. The tile and grout dries quickly from the powerful vacuum of the truck mounted system. Truck mounted hot water extraction- chemical cleaning is the safest way to clean tile and grout flooring; because all of the bacteria, allergens, and bugs are vacuumed into the outside truck mounted storage tank, and driven to a waste disposal site away from the home. The dirty water is not flushed back into the home's sewer system. The tile and grout lines are restored to their original color restoring the floor to its brand-new appearance. Truck mounted hot water extraction chemical cleaning is done with a cleaning unit mounted on the floor of the truck body, and hoses running into the house for water and vacuum. The solution line also runs to the house from the truck. The floor cleaning applicator is attached at the other end of the line inside the home. This applicator has a large circular cleaning brush attached that rotates as the cleaning application is applied to the tile and grout. The hot water is then used to wash away the solution at a very high pressure and vacuumed away with an equally high pressure. The fast moving super-heated hot, water cleans stains, dirt, and grime away from the tile, stone, and grout lines. Heavy duty fans can be used if there is any remaining moisture in the house. 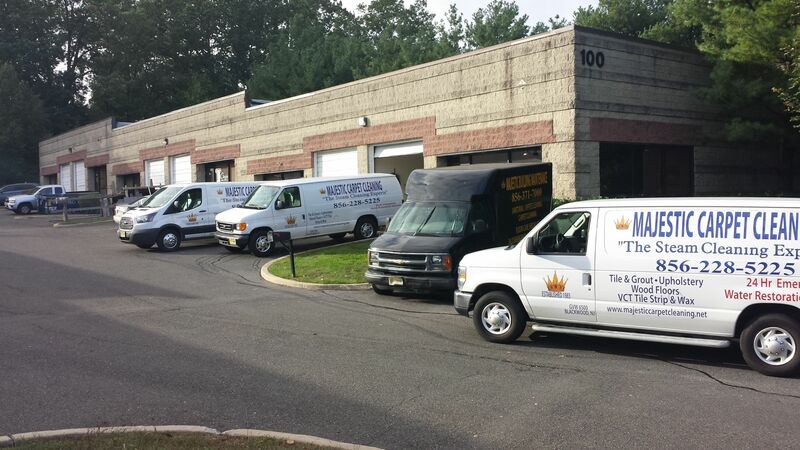 Majestic Carpet Cleaning is the perfect company to call for Quality Tile and Grout Cleaning in Moorestown, NJ. We are bonded, insured, and licensed for the homeowner's piece of mind. Call us today.